Operation Unified Protector (OUP) in Libya illustrated the urgent need for civil-military command in the sense of at least de-conflicting primary operational processes of military and international civilian actors. A military theater such as Libya is externally connected and surrounded by huge (additional) movements by air, sea, and land. This chapter provides insight into network structures and practices for achieving such de-confliction in the context of complex peace operations. Based on a case study and prior responsibilities of one of the authors, the chapter shows how NATO's Allied Movement Coordination Centre (AMCC) functioned as a linking pin between military and international civilian actors. Challenges it faced are addressed, including establishment of relationships with relevant actors, understanding their ways of working, and developing procedures to coordinate a heterogeneous network. “Man with lantern: Who are you? Captain: The Flying Cloud. 220 days out of New York and 50 days trying to find your blasted harbor. Man with lantern: Nobody asked you to come. Captain: Got anything in this hog-end of the world except fog? Globalization has led to a soaring of trade and transportation over the past decades. This includes land, sea, and air transportation of people and goods. Massive transportation affects networked operations such as Operation Unified Protector (OUP) in Libya and their command and control. Stated differently, deliberately designed corridors within and outside the theatre can support mission success from a military1 and humanitarian2 perspective. In addition, crises and operations may trigger mass evacuations to areas adjacent to the theatre (van Fenema, 2012). Current operations often combine diverse civil and military organizations using the Comprehensive Approach as a method of pursuing high level goals (Crawshaw, 2007). Operations demand and secure corridors to focus on the area of operations. New questions are raised such as: how joint and combined access to the theatre is assured (JCS, 2012); how restricted operations zone (ROZ) are organized (Docauer, 2011); how large numbers of civilians are evacuated; and who is capable, responsible and authorized for operationally de-conflicting multiple networks such that operational effectiveness is enabled. Answers to these questions depend on the type of operation, including changes during the operation (Rubbini & Vindua, 2012). De-confliction concerns the awareness of which actors should change their transportation pattern, which actors are denied access to the theatre, and which actors may contribute to the theatre. In addition to awareness, decision making must be authorized and decisions must be effectuated (Monsuur, Grant, & Janssen, 2011; Rietjens, Kampen, & Grant, 2010). Information processing underpins these processes, relying on geographical information, existing civil and military databases, and access to actors interested in using the theatre’s air, sea and land domains. Numerous studies have appeared on complex peace operations (C. H. de Coning, 2008, 2010), focusing on interagency cooperation, command and control, and cooperative planning (Stringer, 2010). Yet it seems that operational de-confliction is often assumed. We define operational de-confliction as coordinating physical flows of people and goods within and or around theatre such that mutual interference is minimized. 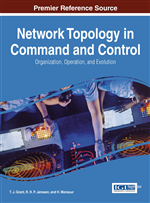 This aspect of command and control increasingly has become a complex, multi-network challenge. The objective of this chapter is therefore to contribute to the understanding of operational de-confliction in complex peace operations. We focus in particular on operational de-confliction in networks consisting of military and a great variety of civilian actors. Operation Unified Protector (OUP) that took place in 2011 in Libya is used as a case study for this. Within this case study we focus specifically on the operational de-confliction of air movements to and from Libya as an example of Civil-Military Interaction. The chapter is structured as follows. The next section (Conceptual Framework) provides an introduction to civil-military networks in complex peace operations and outlines the framework to analyze the case. We then describe the case OUP (Managing the Libyan Theater), and identify lessons learned and analyze the case (Lessons Learned and Conceptual Analysis). The final section (Conclusion: Mind the Gap) draws conclusions mainly from the perspective of AMCC.